Get peace of mind with the Made in USA MonsterMan Grip as CA DOJ/BOF admitted it being a "Non Pistol-Grip" in a court of law!!! For over 11 years the MMG has been sold in California and is one of the most recognized legal products for "Off List" rifles!!! Photo of a happy customers rifle!! MMG, thanks so much for the fast shipping and quick correspondence! This is, bar none, THE most comfortable compliant grip I’ve ever experienced, and I see many long walks in the woods and great days at the range with my AK ahead of me, thanks to this craftsmanship. The MMG-AK "Featureless Grip" is the go to grip for turning your CA Legal AK-47 rifle into a "Featureless" AK. With CA DOJ testimony that the MMG is not a "Pistol Grip" in the eyes of the law, people feel comfortable using the MMG-AK to keep their rifles legal. The made in the U.S.A. MMG was created by a Californian who wanted an AK style rifle that did not have a "Mag Lock" on it, keeping the rifles ability to have a detachable magazine. 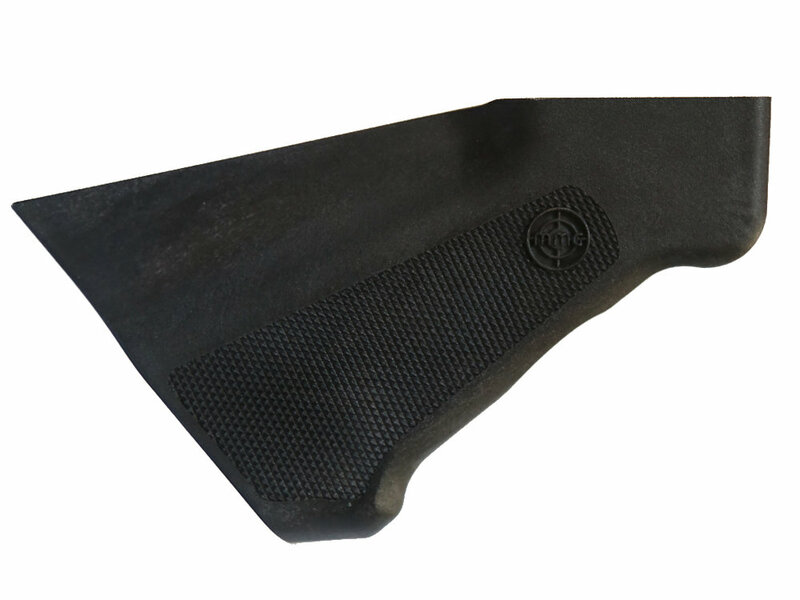 The MMG-AK is a patented grip designed to replace the pistol grip on a off list AK-47 type rifle allowing users to keep their magazines detachable in California. Users must also remove all other banned features on semi-auto rifles with detachable magazines. Made from glass fiber filled nylon, the grip is very strong to meet the most demanding needs. The all new MMG-AK is made from glass filled nylon providing superior strength while keeping it light in weight! No adapter or trimming needed! The New MMG-AK is designed to fit standard Romanian AK47 stock profiles. This grip has side texture and logo like the popular MMG-AR. NOTE: A customer has informed me that he had an issue fitting a MMG-AK onto a Bulgarian Arsenal SAM7r. He had to use a slightly smaller screw (he picked one up at a local hardware store) and he had to file some plastic off the grip to make room for the trigger guard. He did get it on after those slight modifications. Keep your AK47 legal and your magazines detachable by simply replacing your banned pistol grip with this legal grip alternative. CA BOF Agent Frank Navarro testified in a California courtroom that the MMG is legal when correctly used. Make sure you use with a fixed stock that prevents the hand from wrapping around the grip and no banned features on your off-list AK rifle. The MMG-AK is a wood grip that is manufactured by Iron Wood Designs. It is made to fit a "off list" AK-47 type rifle so no adapters are needed. It comes "un-stained" so you can stain it the same color as your existing AK furniture or stain it what ever color you want. The grip is very comfortable to hold in your hand while shooting and it mounts very securely to the rifle. These are much more expensive than the nylon MMG-AK grips due to the fact they are hand made out of wood. ATTENTION NEW YORK & other states, the MMG may benefit you guys as well. When using the grip, it often removes it from the "Assault Weapons" category of most states (See your local laws to be sure it will work for you).